Blue Horizon Gloves (Pvt.) Limited Sialkot Punjab. 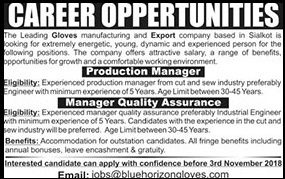 The Leading Gloves manufacturing and Export company based in Sialkot is looking for an extremely energetic, young dynamic and experienced person for the following positions. The company offers an attractive salary, a range of benefits, opportunities for growth and a comfortable working environment.